The EMC1422 is a high accuracy, low cost, System Management Bus (SMBus) temperature sensor. Advanced features such as Resistance Error Correction (REC), Beta Compensation (to support CPU diodes requiring the BJT/transistor model including 45nm, 65nm and 90nm processors) and automatic diode type detection combine to provide a robust solution for complex environmental monitoring applications. 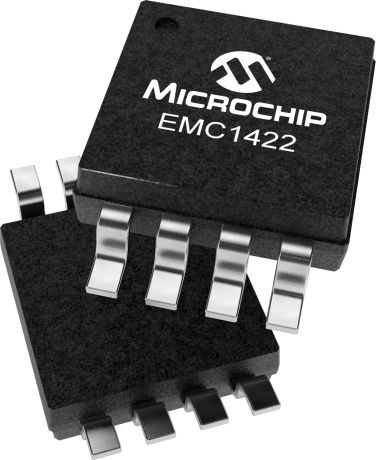 Additionally, the EMC1422 provides a hardware programmable system shutdown feature that is programmed at part power-up via two pull-up resistor values and that cannot be masked or corrupted through the SMBus. Each device provides ±1° accuracy for external diode temperatures and ±2°C accuracy for the internal diode temperature. The EMC1422 monitors two temperature channels (one external and one internal). Resistance Error Correction automatically eliminates the temperature error caused by series resistance allowing greater flexibility in routing thermal diodes. Beta Compensation eliminates temperature errors caused by low, variable beta transistors common in today's fine geometry processors. The automatic beta detection feature monitors the external diode/transistor and determines the optimum sensor settings for accurate temperature measurements regardless of processor technology. This frees the user from providing unique sensor configurations for each temperature monitoring application. These advanced features plus ±1°C measurement accuracy provide a low-cost, highly flexible and accurate solution for critical temperature monitoring applications.